Vertical blinds are vertical lengths of fabric that are clipped to a sliding track at the top and operated with a plastic wand or chain. These pieces of fabric (also known as louvres or slats) are joined together by weights to ensure the louvres are evenly weighted across the length of the track, no matter if they’re fully extended across the track or nestled together to let extra light inside. The louvres are also joined together by a chain at the bottom which works to stabilise the blinds. While the construction of these blinds seems straightforward, they’re designed to allow ultimate control over privacy and light in any environment. The vertical louvres tilt and turn depending on how much of a gap the user wants, plus they can also be drawn back completely to enable more light into a room. That makes them a great option for any space where control is paramount but where good design is also crucial. What Type of Windows Best Suit Vertical Blinds? Larger windows that may not suit horizontal or roller blinds are ideal locations for vertical blinds. Thanks to their construction of louvres weighted together, they can be adjusted for windows of any length. If you’re fitting blinds to a patio window or a long window inside an office, for example, vertical blinds offer a level of light flexibility that other styles simply can’t match. If you have a challenging window space that is sloped or has a split drop, vertical blinds are also an effective solution. While you might struggle to install horizontal blinds across a pitched space, individual vertical louvres can be tailored to your space, meaning that different lengths can be used and the window can be fully covered. Any space that would benefit from floor to ceiling blinds such as a conservatory or a summerhouse are also prime locations for made to measure vertical blinds. Privacy and control are two of the key benefits of choosing vertical blinds for your windows instead of the other popular options on the market. Vertical blinds allow you to control the amount of visibility into a space without sacrificing light entry. So, for someone who wanted to ensure that their conservatory received plenty of natural light without having to worry about everyone being able to see inside, vertical blinds are an excellent idea. The tilt and turn mechanism can be manipulated to allow the slats in the blinds to be opened at varying degrees to suit the users. Similarly, the amount of light that enters a space through vertical blinds is often superior to the amount of light that makes it through horizontal blinds, especially those in thin spaces. Vertical blinds can therefore be a way of admitting more light through a small window without sacrificing any privacy. Another important benefit of vertical blinds is that they don’t have to be boring – there are plenty of designs to choose from that will fit any colour scheme and any style. One concern that householders often have when they’re thinking about vertical blinds for their home or office is how much effort they’ll take to clean. The truth is, they require comparatively little maintenance to keep them looking good. Generally, the louvres on vertical blinds can be cleaned with just a damp cloth. That will get rid of most dirt and dust that might attach to them. It’s also a major difference between vertical and horizontal blinds – while horizontal blinds trap debris between their slats, the louvres of vertical blinds allow the debris to fall instead. So, if you’re looking for one fundamental reason to choose vertical blinds over horizontal ones, the ease of maintenance might be it. Cleaning the rail that the blinds hang from can be time-consuming, but this is an occasional task and so won’t need to be undertaken too frequently. To clean the rail, unclip each of the blinds and wipe the rail with a damp cloth. If you want to ensure that the blind mechanism continues to work unimpeded, you can spray a small amount of silicone spray into the side rail – just be careful not to stain the fabric of your louvres when you rehang them. For more stubborn stains, fabric stain removers can be used in line with the manufacturer’s instructions. Be aware, though, that you run the risk of the treated area looking slightly different to the rest of the fabric by using this method. What are Blackout Vertical Blinds and Where are They Used? 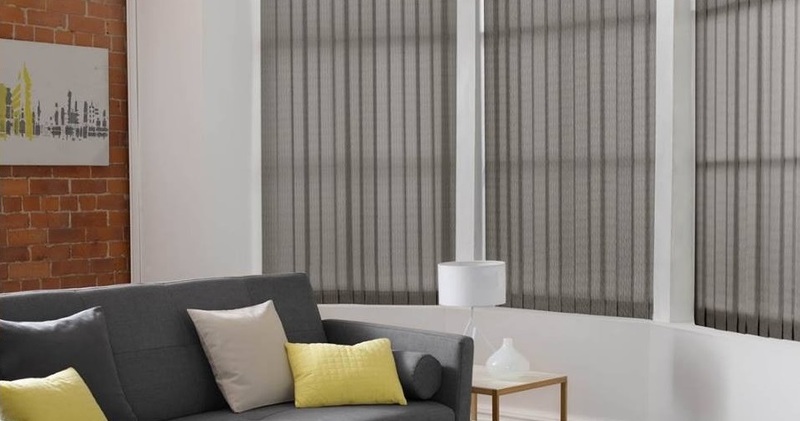 Blackout vertical blinds give a room total privacy and block out more light than general blinds. For bedrooms, especially, blackout blinds can ensure that the amount of visibility and light allowed into the room is controlled at the same time as offering a blind solution that can be fully drawn back to allow plenty of light in. Once again, blackout vertical blinds are ideal for rooms with large windows which would struggle to accommodate either horizontal blinds or a roller blind. At Blinds Direct Online, we have a range of vertical blinds that will suit every home and every budget. We’ve used feedback from our customers to improve our range of blinds wherever possible and we keep a close eye on all the latest trends, so you’re bound to find something that’s right for your home. Blinds Direct Online have committed to keeping costs low by developing a low-cost supply chain that doesn’t compromise on quality. We’re so certain that we’re ahead of the pack that we operate our Lowest Price Guarantee – if you can find an equivalent product at a lower price elsewhere, we guarantee to match. 20 years of experience has gone into blind design, manufacture and service that meets our own high standards. With more than 500,000 homes nationwide benefitting from our quality blinds in recent years, we know we must be doing something right.